It was raining, so we started by talking about that. As it happens, one of the kids had just come back from Colorado, recently ravaged by floods, so the conversation naturally turned to flooding. That segued into flood damage, followed by what one might save in a flood, and, from there, saving a Torah in a flood. It was Sunday morning, and I was teaching 7th graders. “Would you save a Torah from drowning?” I asked the class. “Yes,” all of the students agreed. “Because,” one of the students replied, “it would do the same for me.” Tee hee. The funny thing is that it would. The Torah is one of the three parts of the Bible, the other two being the “prophets” and the “writings.” The students’ haftarah portions come from the prophets. The writings include well-known works like the Book of Esther (more commonly known as the “Megilah” and read or chanted on Purim), Psalms (such as the famous Psalm 23 that begins “The Lord is my Shepherd”), and so on. The great Rabbis gave us two major kinds of commentary on the Bible, the first in the form of the Midrash, and the second in the form of the Talmud. It’s that second compendium that offers advice on all manner of things: when to light Shabbat candles and how to read the Torah, why some kinds of damages are like oxen but others like pits, what kind of damage an ox owner is responsible for and why only dead elephants can be used as a wall for sukkah, etc. One passage in the Talmud section known as kiddushin addresses the obligations a parent has toward a child, including the stipulation that the parents are supposed to teach their children to swim. Without the Torah, we wouldn’t have the Bible. Without the Bible, there’d be no Talmud. And it’s the Talmud that records the importance of knowing how to swim. It’s a round-about result, but the Torah did save us from drowning. The student had it exactly right. This is how a conversation about the weather and our weekend plans turned into a lesson about the centrality of Torah in our lives. The past few days have highlighted for me once again the degree to which our religious nation is divided. The same Gospel Coalition is promoting an anti-homosexual marriage blog post: Gay Is Not the New Black, written by Pastor Voddie Baucham. Most of the reactions to these kinds of claims come in one of two varieties: (1) How could anyone possibly agree? or (2) how could anyone possibly disagree? 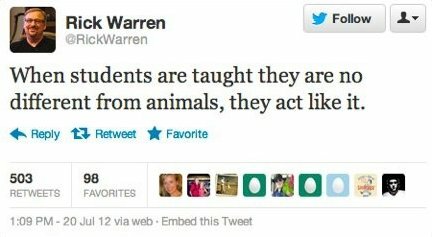 The naysayers cite their evidence: Pastor Warren has misunderstood the allegorical nature of Genesis, and misunderstood the natural world in that animals don’t tend to slaughter their own kind. Pastor Wilson has ignored passages such as 1 Corinthians 7:3-5 that put men and women on a par in the marriage bed. Pastor Baucham has taken 1 Corinthians 6 out of context while ignoring other relevant passages of Scripture. And so forth. Then the claimants respond with their own evidence: Morality comes from religion, Colossians 3:18 subordinates women to men, and Leviticus forbids homosexuality. As a Bible scholar, it’s abundantly obvious to me that both sides find ample support in Scripture. The Bible doesn’t take a clear stance on evolution, why people commit violence, or what marriage looks like — not beyond what we all agree on, at least. But I don’t think that these are debates about evidence, science, or religion. In fact, I don’t think they are debates at all. They are, rather, collections of diatribes — monologues, as it were, instead of dialogues. And that’s because we tend to focus on our self-selected evidence instead of our motivations. For example, if Pastors Warren, Wilson, and Baucham discovered that they were wrong about the intent of the Bible (as I believe they often are), would they change their minds? If a new manuscript surfaced, or a better understanding of the text presented itself, would they care? My suspicion is they would not. Like slavery in its day and usury before that, these issues don’t start with the Bible. They start with how we feel. So if we’re going to have a real conversation, I think it has to be about our motives, not the texts we choose to support them. I think he’s misunderstood the role of religion. I know he’s misquoted the Bible. Dr. Dawkins seems to be missing the essential point. He says that everyone knows murder is wrong, that there are certain evolutionary reasons to come to abhor murder, that it’s better to live in a society where people don’t kill for no reason, and so forth. But even if all of that is true, it’s religion that encodes this important information, and it’s religion that brings the message to people who are trying to decide how to live their lives. In other words, even if Dr. Dawkins is right that God has nothing to do with morality because some things are immoral simply because they are immoral, it’s still religion that occupies itself with pushing people toward doing what’s right. Ironically, just before the question about morality, Dr. Dawkins stresses that “people who don’t know what they’re talking about should keep quiet,” yet then minutes later he misquotes the Bible to make his point about religion. It’s well know that the translation “thou shalt not kill” is inaccurate. (I go through all of the evidence in chapter 7 of my And God Said: How Translations Conceal the Bible’s Original Meaning. The short version is that the commandment only applies to illegal killing, and the point is that laws about killing, unlike some other laws, are both matters of law and of morality.) In other circumstances, Dr. Dawkins might be forgiven for relying on a mistranslation, but here he’s trying to speak to the very nature of religion and he’s asserting that he knows what he’s talking about. The point of the Ten Commandments is that some things are not only illegal but also immoral, and illegal killing is one of those things. (Again, I go into more detail in my TEDx presentation, starting around 15:20 into the video.) So it’s important to distinguish between “kill” and “kill illegally” (“murder” is pretty close, though a little too narrow, because some killing is illegal but not murder). More generally, Dr. Dawkins seems not to understand the role of religion that he is attacking. He seems to think that, according to the Ten Commandments and religions based on them, the only reason not to murder is that God might catch you and punish you. Some people believe this. But another religion-based approach is that these things are wrong because God doesn’t want us to do them, even if God doesn’t actually punish us. This is no different than making murder illegal — a step that probably makes sense even though most people wouldn’t murder even if it were legal, and some murderers don’t get caught. Perhaps most importantly, I think Dr. Dawkins is wrong. I imagine a thought experiment. You’re a sharpshooter and you’re flying over an island in international waters. As it happens, two people are living on the island. No one (except, now, you) knows they’re there. They have no living relatives. And they’re too old to have children. Because you enjoy your craft you take aim and shoot them both dead. Have you done anything wrong? My answer is yes, because it displeases God. My question is whether Dr. Dawkins thinks it’s wrong, and, if so, why? After all, no one suffers. No one is around to mourn their death, and (because Dr. Dawkins admits no afterlife of any sort) they themselves don’t care that they’re dead. Because the island is in international waters, it’s not even clear that any laws have been broken. In fact, the world may be better off, because you’ve had a fun day, there’s a tiny bit more oxygen left for the rest of us, and you’ve improved your skills, which you can now put to good use. It seems to me that Pastor Osteen, as a religious leader, has a right to believe what he wants and to encourage others to follow. So if he doesn’t accept homosexuality, it’s his prerogative to spread his anti-homosexuality message. But I think it’s dishonest when he pretends that his opinions are those of the Bible. Similarly, if you don’t like homosexuality, it’s your right to say so on air. But I think it’s irresponsible of you to let a guest tell your audience that something is in the Bible without even asking where. This glaring omission is all the more surprising in light of your claim to be “challenging.” Why didn’t you challenge Pastor Osteen on this basic factual issue?